Prepare to impress with this one! If you want to intrigue your friends with your culinary skills, prepare this traditional Italian chicken that can be used for every occasion and above all is perfectly simple to prepare. 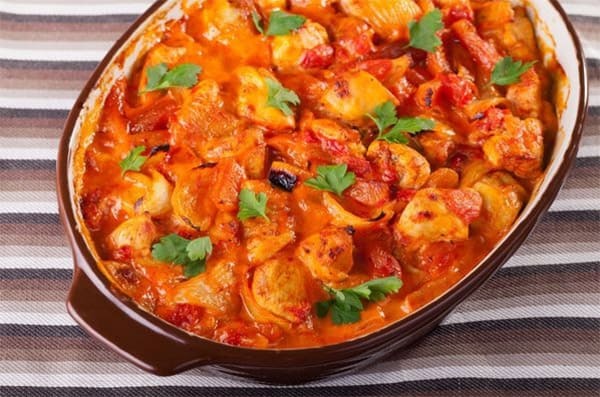 Take a couple of chicken fillets and combine them with tomatoes (what’s a good Italian dish without tomatoes, right?). All you have to do then is add some classic Mediterranean herbs and spices and let the oven to the rest. Doesn’t sound complicated, does it? Dry fry onion and garlic in a non-stick pan. Mash tomatoes, and add to pan. Simmer until sauce is thick. Add spices and parsley. Simmer for five minutes. Saute chicken breasts in a non-stick pan. Place in a casserole and pour over sauce. Bake at 180C for one hour. Serve with fresh vegetables and a large green salad.